Last night Genesis cinema in London’s Whitechapel hosted, besides the extremely popular Eurovision party, the almost as popular uber-feminist screening of Mustang, a debut feature by Turkish writer/director Deniz Gamze Ergüven. The screening was put on by #genesisters, an activist group connected with the venue, in collaboration with The F-Rating which has its roots in the Bath Film Festival. 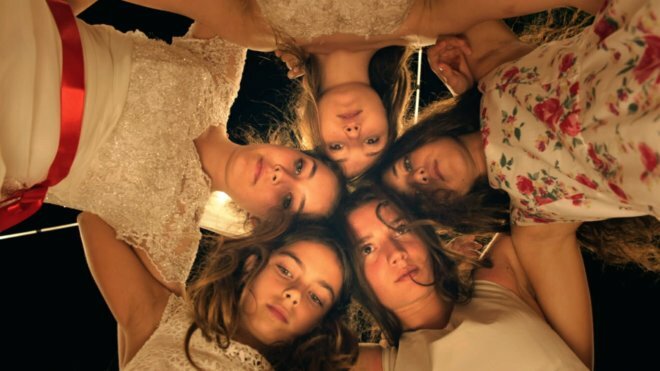 Mustang is a powerful, exhilarating coming-of-age film set in small town Turkey, telling the story of five sisters who fight against the familial and social patriarchy for personal freedom in brave and unconventional, and often hilarious, ways. The screening was followed by a panel discussion and Q&A from various feminist organisations: Feminist Fightback, WOC Film Club, Reel Good Film Club, Gal-dem zine and Another Gaze Journal. After the event I caught up with Holly Tarquini of The F-Rating and Laura Maw of #genesisters. Please introduce your organisations, The F-Rating and #genesisters. Holly Tarquini: The F-Rating is a new feminist film rating for films that are directed by women and/or written by women and/or star significant women on the screen. It can have one, two or three ticks but three is the gold rating. We started it around September 2014. Laura Maw: #Genesisters is a feminist riot grrrl music, film and zine night so each time we have bands, feminist zine stalls or a feminist film screening. All events take place at the Genesis cinema (so Genesis+sisters). Mustang was our first film screening, hopefully first of many. Why did you team up for tonight’s event? HT: Because both organisations are doing great feminist things and feminists should stick together. LM: I completely agree (laughs), that’s a good answer. HT: It was the first triple F-Rated film Genesis that have had, right? LM: Indeed. Also, I’ve never seen it and it got loads of good reviews so I really thought it would be great to do a panel with all women, talking about female-directed film. Are you planning more collaborations? HT: I’m all about collaboration! HT: Genesis is one of around 40 independent cinemas and film festivals in the UK that have adopted The F-Rating. That means they F-Rate their programmes already and it’s growing all the time, more and more people get to know about it, adopt it and rate their own programme. In one sentence, why would you recommend Mustang for people to see (other than its triple F-Rating)? LM: It’s a really moving and accurate depiction of sisterhood. HT: It’s a real joy and pleasure to see so many women on screen at the same time, and all that hair… The hair and the eyebrows. Mustang opened in cinemas nationwide on Friday 13 May and you can find your nearest screening here: http://mustangfilm.co.uk. Join the #genesisters Facebook group for updates and announcements. Images courtesy of Watershed Bristol. First image shows five young women, embracing in a circle with their heads put together, shot from below. They have long hair and white/ floral patterned dresses. Second picture shows a young girl, wearing jeans, red sneakers, red top and brown shirt, being thrown above the crowd of young women. She has a yellow whistle on her neck and is laughing.